Merrychef has over 65 years of foodservice equipment manufacturing experience. They have been designing innovative product solutions since the 1950s, starting with the world's first commercial microwave oven. Merrychef attributes their success to the fact that they focus on putting their customers first - listening, caring, and creating products that meet their needs. 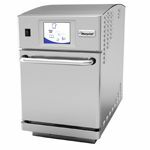 Their equipment lineup currently includes high speed ovens, available in several sizes and capacities, which are designed to make the end user's cooking experience both simple and efficient. Imagine baking a chicken breast in 2 minutes, baking a pizza in 50 seconds, toasting a sub sandwich in 40 seconds, or baking a pan of muffins in 30 seconds. With Merrychef's Eikon high speed ovens, your culinary results are only limited by your imagination. Merrychef P80015 E4 Series Mesh Weave Teflon Coated Basket - 11-1/2" x 13-1/2" x 1"
Merrychef eikon e2-1230 High-Speed Accelerated Cooking Countertop Oven - 0.64 Cu. 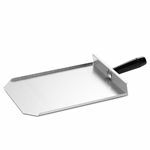 Ft.
Merrychef H5220 E4 Series HardCoat 1/4 Size Anodized Sheet Pan - 9-1/2" x 13" x 1"
Merrychef P80047 E2 Series Solid Bottom Teflon Coated Basket - 7" x 11" x 1/2"